Nearly 3000 people showed up for the first U.B. home football game since 1903 as Buffalo defeated St. Bonaventure by the score of 6-0. But even after the St. Bonaventure game, a full U.B. schedule was difficult to finalized as other schools were reluctant to enter into arrangements with Buffalo after such a vast amount of uncertainty surrounding the U.B. athletic program over the years. 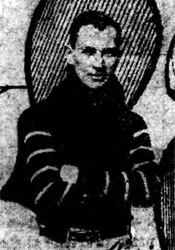 The 1915 team was coached by Frank Mount Pleasant. 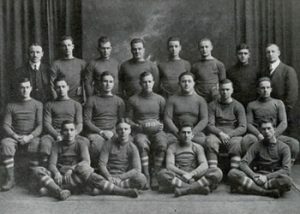 Mount Pleasant played college football at the Carlisle Indian Industrial School and at Dickinson College and competed in the 1904 & 1908 Summer Olympics. He served as the head football coach at Franklin & Marshall College (1910), Indiana Normal School (1911–1913), West Virginia Wesleyan College (1914). He was was a member of the Tuscarora Indian Nation born on the Tuscarora Reservation in Niagara County, New York. This makes him the second Native American U.B. football coach. Bemus Pierce being the first.) It doesn’t seem that U.B. acknowledges this fact in any way which is very odd. You would think they would embrace their unique history as other schools have done. There’s even a library named after Mount Pleasant, the Frank Mt. Pleasant Library of Special Collections & Archives at Chapman University in Orange, California. All things considered, the season was a success. Not including the warm up match against the Syracuse freshmen team, the 1915 Buffalo team finished with 3 wins against 4 loses with one cancelled game. The real victory was that they actually had a team at all. And after the season was over, the city of Buffalo still seemed enthused about college football at U.B. More local high school students announced their intentions of attending the University of Buffalo and playing football in 1916. Things were finally looking up. “U. B. Beaten By Orange Freshmen, Show Great Fight” Buffalo Courier, Buffalo, NY, 10 October 1915. “U. of B. Students Happy Over Win Of Their Eleven” Buffalo News, Buffalo, NY, 18 October 1915. “U. of B. Defeat at Alfred Shows Team Is Strong” Buffalo News, Buffalo, NY, 28 October 1915. “U. of B. Eleven Wins Over Thiel Varsity, 21-0” Buffalo News, Buffalo, NY, 3 November 1915. “U.B. Optimistic Despite Defeat by Geneva Team” Buffalo News, Buffalo, NY, 8 November 1915. “Error of Judgment Robs U.B. of Chance to Beat Grove City” Buffalo Courier, Buffalo, NY, 14 November 1915. “Alfred Varsity Will Not Meet U. B. Wednesday” Buffalo News, Buffalo, NY, 15 November 1915. “Struck Defeat On Rochester” Buffalo Express, Buffalo, NY, 21 November 1915. “U.B. Makes Gallant Defense Against Hobart But Loses” Buffalo Courier, Buffalo, NY, 26 November 1915. STUDENTS WILL SING, MARCH AND ROOT FOR U. OF B. After silence for 15 years the boys of the University of Buffalo will swell their throats to yell for a football team representing their alma mater, Saturday, when a hefty eleven from St. Bonaventure college will stack up against the local footballists. Incidentally it will be “University Day” and the gridiron event is not the only attraction of Saturday’s card. Buffalo’s populace will be treated to a sight that will make its heart dilate with pride, for several hundred students will march through Main street led by a band waving their colors and singing songs of encouragement for the “grid” fighters. No one department of the university will surpass another. The students are co-operating and the procession and the cheering will be marked by a uniform spirit that is expected to carry the football team to a decisive victory over the visitors. The students will gather at Townsend hall Saturday afternoon at 12:45 o’clock and then they will fall in line for the march to International Baseball park, where the scene of battle is set. The boys will march in Delaware avenue to the Terrace, to Main street, to Ferry street and into the baseball park. The 74th Regiment band will lead the procession and the colors of the university, blue and white, will be thrown to the breeze. Several hundred students are expected to participate in the ceremonies that will attend the formal opening of the college football season in Buffalo. For the past two weeks the students have not been neglecting their studies, out have spent much of their spare time practicing all kinds of stunts with which they will both surprise the faculty and entertain the public. The various classes have organized and temporary officers have been elected to lead them in cheering and singing. The spirit of the students was not crushed by the defeat that the local gridiron experts sustained at Syracuse last Saturday, when the “frosh” of Syracuse almost scored at wild. Two of the local boys were injured in the first part of the game and their lose seriously handicapped the team. It was their first try in such a long time that almost any excuse is acceptable. And in addition to whatever else happened the student body of the university was not there and that counts for a lot. Mount Pleasant is confident of victory. He has been putting his followers through a strenuous work out for more than a week and there will be no excuse for being out of condition. However, two of their best men, who were hurt in last Saturday’s game, will not be in the line-up. The battle between the teams representing the University of Buffalo and St. Bonaventure’s will be preceded by an extra-splendid attraction. The Lafayette High school team will line up against the Syracuse freshmen who have a team that is said to be second to no other in the country. The spirit of the day and the two excellent gridiron battles are expected to draw one of the biggest crowds that ever wended its way into International park.